These GermGuardian filters are designed to get your air clean again. If you're an allergy sufferer, replacing your filters for everything in your house is a necessity! This are sure to help keep your home's air clean AND help improve your breathing. This is a generic product designed and engineered in the United States by Think Crucial. This is not a GermGuardian OEM product and is not covered under any GermGuardian manufacturer's warranty. The GermGuardian brand names and logos are the registered trademarks of their respective owners. Any use of the GermGuardian brand name or model designation for this product is made solely for purposes of demonstrating compatibility. HIGH QUALITY AIR FILTER that can replace your GermGuardian Air Purifier's filter. Get back to having a clean air to breathe again! This filter fits AC5000 Series. HEALTHIER LIFESTYLE! No one wants breathe dirty air in their home and if you don't clean your air filter that will be exactly what you'll be doing! Replacing your filter will help clean your air purifier's air and allow for a healthier lifestyle! 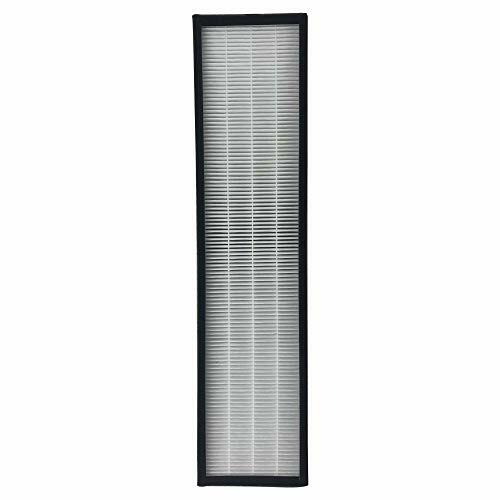 This filter helps keep our household dust, pollen and mold spores. This filter is comparable to part # FLT5000 & # FLT5111. SAVE MONEY by using a new air filter! When your furnace or air conditioner has a clogged or dirty air filter it can cause it to work harder which will end up hurting your electric bill! EASY TO INSTALL so you can get back to breathing in clear air as soon as possible! Simply remove your old filter and put this brand new one in it's place! This filter is approximately 1.29" x 4.76" x 15.77" inches. If you have any questions about this product by Crucial Air, contact us by completing and submitting the form below. If you are looking for a specif part number, please include it with your message.